After a few weeks of oxygenating plants settling in and beginning to grow in the water, and the water lily sending up tentative buds, and the floating water hyacinths spreading, and water lettuce trailing long wispy roots, and the pump pumping with Teutonic efficiency, and the water clearing, and no signs of the raccoons getting past the chicken-wire frames&emdash;it seemed time for the fish. I went into one of those pet supermarkets, thinking they might have the greatest variety, and viewed a wall of multicolored fish. There seemed to be a discouraging number of belly-up floaters. The shop seemed to hire only very young people, no doubt at minimum wage, whose real lives seemed to be going on elsewhere. When I pointed out some belly-up fish, the young woman who seemed least reluctant to help me, desultorily scooped them out with a net and carried them away for what I feared would be less than full military honors. I was looking for simple goldfish, like the ones they used to give us when we were children at the fairground&emdash;for flipping ping-pong balls into the open necks of the small round bowls they were kept in. It was almost impossible, of course, but now and then by some miraculous fluke, and much to the attendant's chagrin, a ball would bounce around and settle on the water of a bowl. A thousand years ago. Peering into one tank after another, I couldn't find a simple goldfish. First I eliminated all the tropical fish for indoor aquariums, which was most of the wall. I was left with maybe ten or a dozen tanks of outdoor fish. But even those that looked more or less like goldfish were called something else, shibunkin or sarasa or even more exotic names, and were usually red and white or multicolored or exotically shaped. I didn't want koi, as the pond seemed too small to house the juicy monsters these might become in a few years. Here I was, no longer the little boy who carried a goldfish in a bowl home from the fair with freezing hands, with the money to afford what I wanted but unable to find the simple goldfish of yore. Obviously some parable there. I didn't mind that they wanted $10 or $15 each for these exotic beauties. I would have paid more for just regular goldfish. Rather plaintively, I fear, I asked whether they didn't have anything more ordinary. After examining each tank with the apparently tranquilized young woman, who seemed to know remarkably little about her charges, and my asking each time for something more like a regular goldfish, she floated away smiling vaguely, to be replaced by a young Asian man. He edged towards me, perhaps as the result of some signal from the young woman, whereby hopeless customers were passed around. Though the whole staff seemed too enervated to be able to work out a system of any kind. After going through the same routine of showing me the exotic fish and saying how great each was, and my asking for just a simple goldfish, he said, rather mysteriously, that there was another possibility. Looking around a bit furtively, he sneaked me into a narrow room at the end of the wall of fishes, into which the tranquilized young woman had earlier borne the corpses. Inside was an enormous tank crowded with gazillions of little goldfish, exactly what I was looking for. He was clearly disappointed at my enlightened face, and told me these were "feeder fish", and I could have them for 12c each. "Why are they called feeder fish?" I asked. With a look of bewilderment at my naiveté, he said "Because we sell them as food for bigger fish and turtles." I think he concluded he was dealing with a potentially unstable crazy when I expressed shock. It wasn't catatonic shock; more like mild surprise, as I realized that nature red in tooth and claw had to be accommodated even in pet supermarkets. But he treated me as though I was perhaps a dangerous animals' rights activist come to avenge the feeder fish. But even so, the commercialization of producing "feeder" fish for other more expensive fish, seemed a tad grotesque. I described the size of my pond and asked how many I should get, so they would feel comfortable and not too crowded or too few. I had been imagining ten or a dozen, but he recommended my taking 100. So I did. The young man, in packing up the fish, and trying to find some logic in a clearly nutty customer buying feeder fish to inhabit his pond, said "You're probably better off with these to start. I mean, they only cost 12¢ each, so if you find there's something wrong with the pond water, it won't cost so much. If you bought some of the more expensive fish and they died, it could be more of a problem, like." Where did he learn to think about living things merely in money terms? In the shop, no doubt; that's how fish were classified, and valued. But how depressing. He slurped about 100 into a large plastic bag, and my wife and I zoomed home to get them into pond before they died for lack of oxygen or from poisoning themselves with their own excreta&emdash;the nitrogen does for them. That's why the pond has been crammed with oxygenating plants and a pump that delivers nitrogenous stuff to the bog where it will fertilize the bog plants, I hope. We rested the bag on the pond for ten minutes or so, then opened it up and let a little pond water mix with the water in the bag. We were distressed to see that three or four of the fish were already dead. We waited for a while longer, gradually adding more pond water, and checking to see that the temperature in the pond was about the same as that in the bag, then we gradually released them, and the pond came to life. They took off, zoomed around, dove down to the bottom, some hung around the shelf where we released them, but on the whole they seemed happy to explore. We left them to it, covering the pond with the chicken-wire frames for the night. The next day there was another dead fish. Two days later a couple more. For the next few weeks they were dying two or three a day sometimes. I scooped them out and gave them an inadequate burial. The only consolation was my wife's assurance that their few days or weeks of life in the pond were likely happier than the fate they were due for in the shop or serving their grizzly role as feeder fish. But what was I to do? Was the pond contaminated in some way? Or were the fish diseased, and were they all going to die? I prepared a hospital bucket&emdash;with oxygenating plants and sprinklings of food&emdash;into which I put any fish that showed symptoms of disease. Some had fluffy growths, some just got torpid and floated helplessly, giving a reluctant kick if approached too close. Nothing survived the sick bucket for more than a couple of days. Should I empty the rest of the fish out of the pond? But where to put them? In the midst of all this death and dismay every morning&emdash;my peaceful pond a scene of megadeath&emdash;I had to go to Hong Kong for about ten days. My wife's emails assured me deaths were fewer and fewer while I was away. After I came back there seemed to be hardly any deaths. The remaining fish&emdash;only about 30 or so--seemed to be thriving, growing and energetic. I went to a small local fish shop&emdash;Noah's Pet Ark&emdash;and asked what I should do. I didn't want to add more fish until I was sure the pond was healthy. I was told that I could medicate it, at a stupendous cost, or I could feed the fish some medicated pellets, which I bought. I was also assured that there was generally a significant death rate for these feeder fish in late spring. "You should see how they come," the large young woman in the shop said. "China. In tanks with thousands of them crammed together." She sounded disgusted. She thought that it should be safe to add new fish if there had been no deaths for a couple of weeks. Our younger son had come along to buy me a birthday present of four shibunkins. Sturdy looking brutes, blue and black with spots of red, and long graceful tails. My sister-in-law also wanted to buy some fish for my birthday, so four white and red-blotched sarasas were added, and my other son contributed another four shibunkin. There hasn't been a death now for many weeks, and the menagerie drift and dart to and fro in the pond, nibbling the algae on the liner, exploring the pond generally, sometimes sitting under the waterfall where I suppose the oxygen rich water comes in. I feed them a little each morning after removing the chicken-wire frames, so they now gather mouths a-gobble near whereever I stand, as though they hadn't eaten for a week. But the anxieties of caring for a fishful pond never cease. The other morning I came down to find the biggest and greediest Shibunkin with a horrible looking growth in its mouth. It was dull gray and half inch long. When the fish came to the surface, trying to get at the food I had sprinkled, its mouth was working away at the growth&emdash;it looked like a larva of something. I phoned Noah's Pet Ark again, but none of the young women I talked to had ever heard anything like the mouth growth I described. "Catch it then pull it out with tweezers," the most authoritative young woman suggested. Easy for her to say. It took me an hour to catch it, maneuvering two nets. It was not only the biggest but also the smartest fish. I could have caught any number of the others, as they gathered to admire the net, and nibble at it. But the shibunkin was fast and elusive. I circled the pond, as did it. But I finally got it. I kept it in the net and lay it among the stones under the water at the shallow shelf. I then tried to get at the thing in its mouth as it thrashed. Finally I got the gray lump between the tweezers, and pulled gently. Out came a whole four-inch worm, which had clearly gone for a walk and drowned. The shibunkin had bitten off more than it could chew, and then couldn't get it in or out. I read that one should fertilize the 'marginal' plants sitting in pots on the shelf around the pond. The top of each pot was a few inches below the water level, with a couple of inches of gravel over the soil to prevent it seeping into the water. The fertilizer came in the form of hard, round pellets, which one pushes in through the gravel and down to the roots, using thumb or finger, as long as one doesn't fear snapping thumb or finger thrusting the sharp-edged pellets down through the resisting gravel and soil. While getting the fertilizer to the plants' roots proved a bit painful, the grateful plants responded within a few days with impressive growth. I had bought a couple of pots of splendid variegated flags, with long graceful stems, and some bulrushes, sedge, umbrella plants, papyrus, and a few pots of miniature bamboo. The plants grew taller and taller, and looked perfect at the rear of the pond. Early in the summer we had a day of high winds. The few early fallen leaves were swirled around, and the cheerful gusts romped through the trees and plants. Looking for something else to play with, it pulled the tall marginal plants to and fro, and toppled them into the water. I came home that day to find the pond muddied and tops of the plants trailed across the surface. The added sludge had caught in the pump filter, reducing the waterfall to half its usual flow. Being a bit harassed and short of time, I thought I'd first try to clean the filter while the pump was working, instead of turning it off to do the job. Every week or so I'd been removing the filter and swishing it around in a bucket of water to clean it, so I could now do it efficiently in a couple of minutes. I sat on one of the flat stones at the side of the pond and pulled on the hose, hauling the pump up to the shelf where the marginals had been, making sure to keep the pump under the surface. With one hand I slipped off the filter and began swishing it around in the bucket of water. The fish have become very tame, and associate a human figure sitting by the pond with feeding time. I was suddenly panicked to see them all gathering around the pump. Without the filter, the fish could be sucked into the pump! What could I do? I couldn't pull the pump out of the water as it would wreck the motor, and I couldn't leave the pump there pumping while I ran to the switch&emdash;thirty feet away&emdash;as I might lose a dozen fish to a grizzly fate. The fish clearly thought this was a new form of feeding, or perhaps they were just feeling sociable, as it seemed all forty of them gathered round, heading lemming-like for the pump in-take. Then I heard a horrible sucking sound and the pump groaning. Was that a fish? I put the pump down on the shelf, splashed the water to shoo the fish away and scrambled to unplug the pump as fast as I could. I got back to see the water flowing out of the pump as the pressure from the bog reversed the flow. No fish parts evident! I cleaned the filter at more leisure, slotted it back on and then, maneuvering the stiff hose, lowered the pump onto its watery throne of gray bricks and switched on again. After a minute or so the bog filled and the water poured over the waterfalls, danced cheerfully among the stones, and threw itself musically into the pond. I still find it hard to resist the irrational expectation that the constantly tumbling waterfall must soon overflow the pond, like a tap one forgets to turn off in the bathroom. It is such a simple system, pumping the water up to the bog and letting it run down again to the pond. But, of course, the planet works on a fairly similar system, sucking water off the oceans, dropping it on the land, and letting it finds its way back down to the oceans. There must have been many a philosopher in days of yore who sat by major rivers watching the might flow into the sea, wondering why it wasn't overflowing. Where WAS it all going? The solution to the toppling plants, after I'd carefully hauled each of them from the water, was to repot them into wider and heavier plastic baskets. I'd kept them in the pots I had bought them in, and hadn't noticed that roots were pushing out the bottom, and in one case overflowing the top too. I had anticipated that repotting would be a tedious chore, especially as I was now beginning to think of building the tea house&emdash;hammering and sawing and bolting and cementing&endash;&endash;but it proved to be surprisingly pleasant. You have to picture this: on a sunny Sunday afternoon in summer, sitting (sibilantly) in a garden chair, repotting water plants. You must also recognize that I have never been the kind of person who dreamt that such an activity would ever figure among his pleasures. My daydreams were more in the "Oh the pearl seas are yonder" line of romantic adventure than in domestic ministration to green bog weeds. But there I happily sat through the slow afternoon, with buckets of water, heavy wet soil and chunks of gravel, entirely happy with my very small realm of action. The job involved slipping part of a garbage bag into a square, thin-mesh-sided plastic container for water plants. The garbage bag material would minimize soil seeping into the water, and I punched some holes in it to allow water to seep into the roots. With a trowel I dug from a large bag of specially formulated rich heavy soil that wouldn't be tempted to float out of the container and take a runner all over the pond. I then plopped a couple of fertilizer tablets into the soil and slipped the tall plants from their plastic pots and settled them into these much larger, and heavier containers. I covered the soil with a couple of inches of rather attractive granite gravel, and carefully lowered them one by one as the shadows lengthened onto the deepest part of the marginal shelf at the rear of the pond. In the middle of this I received a harried phone call from a colleague in Hong Kong. It was Monday for him, and while I sympathized with his problems, I can't deny that the call added a tiny dimension of pleasure to my idle afternoon's messing about with plants. The following weekend, I had too much to do at my desk. All of it seemed urgent, but I couldn't decide among the many urgent items which to start on, so I went out to uncover the pond. The water had not cleared since the high winds had toppled the tall plants and spilled much of the soil from their pots, producing a murky green-brown of mud and algae. I began moving a stone here and there, found a bit of moss and patched it into the moss garden. There seemed a lot to do here as well. I had to get back to my desk, but first I began washing piles of the multicolored stones they call drain-rock in the wheelbarrow. Then I spread them in the small trench around the outside edge of the pond&emdash;so that overflow or heavy rains wouldn't carry muddy water into the pond, but it would drain through the stones into the soil. I then moved a few of the water plants from the surface of the pond and, pushing my fingers slowly down through the wet gravel of the bog, eased the roots in after them. The water hyacinths in particular would be better off there consuming the nitrogenous materials taken from the pond by the pump, and they were also amazing consumers of noxious minerals. The bog looked better with the green and bulbous water hyacinths growing on the damp gravel. One thing led to another&emdash;pruning a bit here, shifting some of the basalt stones around the moss garden to give a smoother slope down to pond level, cutting back some of last year's weak bamboo culms, and so on--till the day was nearly over. My last job was to fill in patches of still water in the bog. I was concerned that they might provide a happy breeding ground for mosquitoes. They wouldn't breed in the pond, as the fish would get them, mosquito larvae being their favorite food. Nor where the water was moving in the stream and waterfall. But those still areas at the back of the bog looked possible sources for mosquitoes. I had a half bag of gravel left over&emdash;an attractive mottled pile of subtly colored stones. I used it to fill in all the exposed bits of water, then piled it around the edges to hide any remaining bits of liner I could see, finishing by tossing the last handfuls around to cover any remaining watery spots. By the end of this desultory day, the undone tasks on my desk seemed much less urgent than they had in the morning. The next morning I came out quickly to relieve the pond of the protective chicken wire frames, which seemed to be successful in keeping raccoons from getting into the water. I had to rush off to a meeting I couldn't miss. The pond was more than half-empty! The fish were in a murky foot or so of water, liner exposed all around, the water lily's leaves drooping down around its exposed pot. What to do? A leak somewhere! Where? How? I had filled a garbage can of water last night and a pail, so I poured them in. I calculated that if it had taken all night to get to this point, I could make it to my meeting and be back before too great a disaster occurred. But that was little comfort, as I had no idea where the leak was occurring. If it was the pond, I should get the fish out now and into the garbage bin, dumping a lot of the oxygenating plants in first. But perhaps it was in the bog&emdash;in which case I would have to dig out the tons of stones. And where would I put them while I looked for the leak? Or was it in the stream? That seemed less likely after my fixing the earlier leak. What to do? I pulled the plug that connected the pump to the power line, and the waterfall slowly ceased. I noted the level at which the water stood. If it was the same when I got home, then I knew the leak was not from the pond itself, but in the bog&emdash;a conclusion I dreaded. The meeting was slow to begin. Colleagues who hadn't seen each other for a while were expansively chatting, one handing around photographs of where he had been on holiday in Italy recently. I could think only of the fish, imagining the water continuing to dribble away while these people idly talked. When the meeting finally got underway, I was impressed that I was able to contribute to the discussion at all. As the talk went to and fro across the table, with handouts of charts I found hard to focus on, I had one of those flashes of vision. I suddenly realized that when I had poured gravel onto the patches of visible water at the edge of the bog, the gravel was drawing the level of the water in the bog higher! It was drawn upwards through the bog finding the least resistance. Before it could flow to the outlet at the lip of the bog, it was finding the top edge of the liner at the rear of the bog! I hoped. The meeting over, a couple of colleagues wanted to dissect what had gone on, comment about the behavior of one of the nuttier contributors to the discussion. After smilingly extricating myself I still faced some paperwork I had to get done, then a computer problem that had to be dealt with. Each frustrating, as I was aching to get home. I sped, constrainedly, across town, running through my options. I couldn't escape the image of flailing fish in inches of sludge. I got home and ran out to the pond. The water level was no lower. I went round to the rear of the bog. The water had been turned off so it wasn't spilling over the liner now, but I could see that the soil where I had imagined the problem was indeed saturated, and even the path in the rear showed signs of heavy damp. I turned the pump on again, waited for the water to rise up the bog, and lo and behold, there it was dribbling out at two points. I pulled away the gravel, and the water level in those areas lowered. I scraped out pretty much all the gravel I had put in the previous day. But what to do now? I couldn't simply pour water in, as the chlorine content would be toxic to the fish. Also it had been a warm day, and the remaining water in the pond was quite warm, and the cold water from the hose would put them into shock. I had bought a small bottle of dechlorinating liquid, so filled one garbage can full, mixed in a few dechlorinating drops&emdash;hoping it wasn't too much. The bottle carried the cheering warning that too much could be as toxic as too little. It indicated that 50 cc would deal with 1,000 gallons. How many drops for a garbage can? Or a pail? I suspect in my hurry I overdid it. I poured in the pailful and emptied the garbage can a pailful at a time. The fish seemed to be delighted, as the stream of water clearly dislodged the brown, caked algae from the side of the pond. Dinner was served. I began to fill the garbage can again, and, while the tap water sprayed in, I rushed in and out of the house and up and down the garden with pails full of hot water, to try to minimize the shock of temperature differences. As with children, one didn't look for thanks. I was reminded out of the blue that my mother had once said in this garden, when she was visiting one time, that children owed their parents nothing. I think this is indeed how parents, but not children, should think about it. My fish owed me nothing either. I was working for their good, not their gratitude. This is what can make keeping fish good for us. After an hour of this, and getting the pond a little fuller, I had the inspiration of phoning the Noah's Pet Ark, from where I had bought the recent set of shibunkins. I could, no doubt, have phoned the pet supermarket, but had little confidence the kids who were dealing with calls there would have any idea. But at the local specialist shop&emdash;which I swear I will patronize exclusively in future--Anna answered and sympathized with my dilemma, and the edge of panic still in my voice. First, I needn't worry too much about the chlorine. I could take the garden hose, and spray it high into the air to fall back into the pond. Nearly all the chlorine would be dissipated by the contact with the air. It was a warm day, and the fish would be able to handle the small drop in temperature the new water would add. But she casually mentioned another variable that encouraged panic again, telling me I needed to add baking soda to the water in order to neutralize the acid. Our local water, it seems, is more acidic than fish can easily survive, and replacing more than half the water should be balanced by an alkaline agent. How much? A tea-spoon per 100 gallons. And how does that work out per garbage can? Yikes. I put in a few spoonfuls, stirred it, and spread it around the pond, to make up for the hundreds of gallons I had put in so far. By the time my wife came home, the water was half way back to where it had been, but even so she was shocked. She immediately started toting pails of hot water to minimize the stress on the fish&emdash;regardless of the stress on us. By the early evening, my panic was all dissipated like the chlorine, and I sat in a chair in the shade of the apple trees aiming a spraying jet of water into the blue sky, which was falling as a gentle rain on the pond. The fish were delighted. ("How do you know...?" "How do you know that I don't know...?"). The next morning all seemed well. The fish were still all alive and the water was only five or six inches below normal. I occasionally compare my life with James Bond's, and it can be a sobering few moments. But the tensions of the seeping away water, the need to make decisions on the run, with inadequate information and lives at stake, adrenaline pumping and heart going hard&emdash;when I had the leisure to notice it&emdash;all seemed to me fairly comparable with the Bond style. I concede a few differences, which needn't be spelled out, and my technologies of pump and hosepipe, plastic garbage can and pail, don't quite stack up with what Q provides, but it was a Bond-like day in which boredom was very far away. What is the meaning of life? Life has many meanings, and among them are the fish in our care. Once the pond is back to full depth, and the fish seem happy, the pleasures of sitting by the pond return&emdash;too much. I go out, and find my work time is being increasingly slowed/reduced by the pleasure of sitting looking at the moss garden or watching the fish. I'll never get the tea-house begun. But, as with most tasks, the trick is to begin. I'll need a shovel and the wheelbarrow to get rid of the mound of clay first, and my wife has given permission to pile it to the rear of the shrubs along the north side fence. (A couple of years ago our neighbors on that side sold their house. Within days it was crunched and carted away in huge trucks, as is the practice here and now. In its place a palace was constructed, a pinkish confection rather out of tune with the rest of the houses, but no doubt our turn would come and something more in tune with the confection would go up. In the process of putting in a fence all around the new house, it was discovered that our neighbors had for decades appropriated, perhaps unknowingly, between two and three feet of our garden. So there was a chunk of empty ground behind the line of our shrubs. That space was to become the repository of the clay from the pond. The clay had by now been moved around a few times&emdash;from the base of the pond to the garden area on the right. Then, when I started building the waterfall, the unused clay was moved over to the left. Once the design for that side was worked out, the clay was wheelbarrowed over to the empty teahouse site, and now it was going to what I hoped would be its final resting-place behind the shrubbery. This multi-stopping eventful journey was the result of Irish planning. One unsolved problem concerned the too shallow shelf at the front of the pond. It was wide and flat, beautifully done&emdash;the best of those around the pond, but useless. I hadn't realized when building it that one couldn't find plants that needed only four or five inches of water. And I didn't realize, as I had plastered the wet sand around the dug-out pond, that I had raised the level of this shelf too much. Sitting by the pond one day I had another of those odd and sudden senses of what would solve the problem. I could have a mostly-submerged stone garden on the shelf, perhaps with some small plants between the stones, and space for the fish to get around to eat up any mosquito larvae. I suppose, in a very minor sense, it seemed like an insight. That is, it wasn't a matter of working it out, or thinking it through, or coming to a conclusion. One finds suddenly that such ideas are already there in one's mind, as though they have been slipped in fully formed while one was looking elsewhere. I scoured around the garden again hunting for granite. For some reason, I had been given the notion that it was to be a granite border, but I decided to fill it out with other small stones. 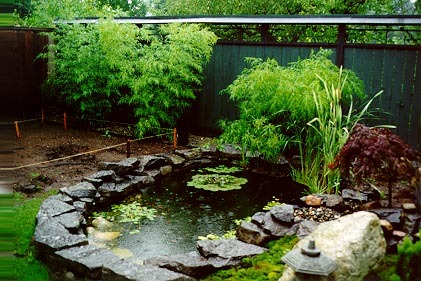 I began with the expensive stones that were to serve as groundcover by the bamboo and under the teahouse. But, under six inches of water among the granite, they looked rather dull. I tried the purple ones, but they too seemed washed out by the strong, bright granite. I finished up laying the drain-rock they sell in bags for next to nothing&emdash;their varied colors were brought out by the water and they give the granite a good setting while not suppressing its glory. Washing the stones was an aesthetic treat. The varied beauty of these colored stones was astonishing. How could anything so beautiful be available for so little in such quantity? Dribbling the stones onto the submerged shelf, I was further bemused by their smoothness, which one takes for granted. Those perfect rounded shapes were achieved over decades, or centuries, rolling down rivers, all their edges clacked away as the waters carried them on, gathered by currents into vast piles, dredged out and packed in plastic bags, and finishing ingloriously as drainage around houses, or a little more gloriously decorating middle-class Japanese-style gardens. Friends and relations now come out before dinner and sit around the pond to chat. People are kind in their comments of appreciation, and often say how I must enjoy sitting here with the sound of the water among the stones of the stream and falling into the pond, and watching the goldfish among the floating plants. Well, yes and no, I want to say, but can't really go into the kind of detail I will now bore you with. Oddly, the pleasure mainly comes through others' pleasure. To have made something that seems to give delight to friends and relations is a delight. But when I sit here by myself, I see mainly what needs still to be done, or what needs correcting. Indeed, I can rarely simply sit without jumping up to move some stones, or scoop some leaves off the pond, or clip back a bit of the bamboo. If I do manage to sit still, I fret about whether the water quality is still all right for the fish, or whether there is a small leak still behind the waterfall, or fear that if the water gets too high it will bring soil into the pond and darken it, or that those stones really should be refitted. They look at the bog and seem to get pleasure from its wall and the wet gravel with the miniature bamboo and water hyacinth growing in it, but I see the layers of hidden stones, and worry whether any shift might crush the pipe at its base . . . and so on. You get the idea. Maybe as time goes by and it all continues to work, then I will relax and see the surface that is delightful rather than the more rugged and makeshift substructures that hold this artifice together. Some, being polite, say something like, "You did it all by yourself? All those stones, the wall, the plants?" I think these must be people who have never moved small things systematically until they become big things. This moving of a stone upon a stone can easily accumulate quickly to a wall. People who have never worked systematically at a single project bit by bit, stone by stone, plank by plank, word by word, get an exaggerated awe before the pyramids. Just a stone upon a stone upon a stone. It's the persistence largely that differentiates the small half-done task from the wonder of the world. I do recognize some differences between the pyramids and this small garden, but responding to people who admire it excessively by saying it really isn't much work, just an irregular persistence towards a not complex project, they take as pretended modesty. But it isn't. We can all make greater works by just gradually accumulating the stone upon a stone, or the plank upon a plank, or another lousy word upon a word. But what does give unalloyed pleasure is to see insects and birds, and the fish, taking this construction as a part of the natural world. I get much pleasure, even joy, from the dragonfly resting on a leaf of the water lily, or birds having an energetic bath in a shallow pool they have found or made in the bog, or the fish taking this artificial pond with its not well-folded lining and German pump sitting on bricks, and the water lily on an upturned planter, and so on, as a fine natural home that provides adequate accommodation and food and light and companionship, or the squirrel that runs along the roof of the fence, or the array of insects that hover over the water . . .Well, you get that idea too. There are creatures who are finding it either an adequate home or a good place to visit. Including raccoons.